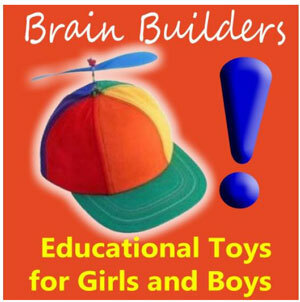 What's more fun than cool educational toys and games for kids? Geek toys and games for kids! Educational games and toys don't need to be nerdy or boring to inspire learning while providing hours of fun. Choosing the best toys or games for your child can be daunting unless you have a few good resources. And for double the fun, these educational toys and games appeal to adults, too. Luckily, kids love to learn and educational toys with a "geeky" side can inspire kids of all ages - including adults - to new heights of creative thinking. This guide will help you find some of the coolest educational toys and games that kids will love, plus resources for parents who take kids' playtime seriously. After all, the work of children is play ... so let's make it productive, safe and fun with educational toys and games that boost brain power. Experienced parents and teachers know that creative play is essential to child development. There's plenty of research available on the topic as well as many interesting articles to help parents-to-be as well as families understand the importance of letting children play. Play and exploration are the foundation of STEAM learning theory. This isn't a new thought, but it's one that sometimes gets lost in the hectic schedules of modern families. "All work and no play makes Jack a dull boy" ... it's not a truism, it's a reality. A real microscope is a cool gift for kids into science. Learning about biology through microscopic inspection is fascinating and fun. I had a real microscope as a kid and it was one of my favorite "toys" as a preteen. Getting a close up look at bugs, leaves, even onion skin opens up a whole new world to curious children. Simple number, letter, aniimal and shape blocks are fine for most kids, but if you're hoping to inspire a scientist or want to add some fun to home school chemistry lessons, get your youngster started off with anifty set of handcrafted wooden cube periodic table building blocks. Nontraditional Learning Environments: Do They Prepare Our Students for Life-Long Learning? Nontraditional learning and teaching comes from shifting the image of the instructor that knows everything to the students having some input and sharing their own knowledge in addition to the instructor's findings. This is a research digest from the DfES Research Informed Practice Site (TRIPS) that deals with a project looking at the impact of pretend play on young children's cognitive development. The researchers find that both teacher-directed and child-directed play build kids brains.